I think i've gone on a bit of a mad one with collars.. you see, its getting colder right? 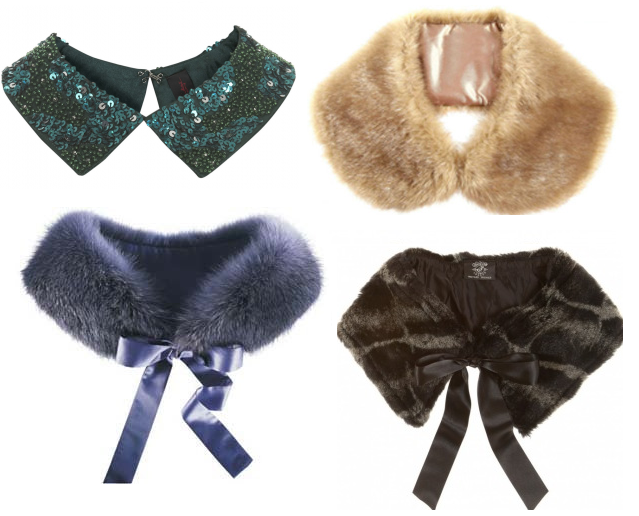 What better way to spice up a jacket or coat than with a new faux collar! I was naughty before because in March (when all the coats are on sale - best time to get a new coat i say) i saw a coat in Topshop for 10 pounds.. i'm not even joking, and that's not with student discount either! Either the girl who served me said 'oh i didn't see this!'. She didn't see it because i took a collar off another coat and put it on to this basic ten pound coat! Yes ok, its naughty but it is now my favorite coat ever! You can find collars everywhere, asos, Ebay, Miss Selfridge... Seriously get a bunch, i'm not even kidding you! i have.. i've got a blonde faux fur collar for my Urban Outfitters renewal military jacket that is on its way to me and i want an electric blue one to spice up my leather jacket (blates copying my acne one underneath but why the hell not). I'm not so keen on the collars with the additonal bow but i can see the black one on a lovely near bottle grey coat!